I bleed the lines 2 times and the fluid was pretty good after installing lines . I’m really not sure but clearly I did not do a good enough job. I guess I will install the new hydraulic lines and calipers and get the fluid crystal clear. I usually run about full quart through, using gravity bleed method for most. Followed by a few pump/hold/crack bleeders for good measure. When doing last step you wouldn't be able to tell the fluid coming out the bleeders wasn't new on my junk. You're going to flush the lines before installing the new calipers I hope. I'd use alkyhol. AKA shellac thinner. Flush til clean than blow them out with air. I'd disconnect from prop valve and rear cylinders first and disassemble and clean the rears too. Then assemble and run a bottle of fluid through. Thanks for the help everyone! I got the axle out last night as I am going to clean it up, repaint everything and replace all bearings and seals, u joints, and Ball joints. I wont really touch the differential as I don't feel comfortable doing that, I will give it a thorough look through to make sure nothing major is wrong. 1. Disconnect each line and hand flush with new brake fluid and a flushing syringe, then blow out with air. 2. Reconnect everything and install new stainless hydraulic lines and larger GM calipers. 3. Flush at least a couple quarts of fluid through the entire system until everything is crystal clear. What are your thoughts of that wear and scoring on the axle shafts near splines that enter the differential? What would cause that wear? IIRC on an open knuckle Dana 44 (ball joints instead of the big round knuckle on the end of the axle tube) there is nothing keeping crud from entering the tube. The inner seal is all that prevents that crud from getting into the center section. Wear on the spindle... I'd run it. Clean it best you can. If it's anything you can really feel with a fingernail then maybe I'd think twice and replace it, you don't want a stress fracture in a spindle of course, but I think in most cases I'd clean it and run it. here is a closer image of the cleaned up axle shaft. Are those grooves stock? or is that from wear? So I am starting to put everything back together and I am running into a potential problem with the new Moog ball joints. I pressed them into the knuckle no problem. When I installed the knuckle back on the axle yoke the lower ball joint nut has a pressed pattern on top of it and its affected the threads on the nut so it was a bi*** to get installed to the 75 ft pounds as it was eating some of the threads on the ball joint. Both nuts are like this for both sides for the bottom ball joints so it must be part of the design to lock the nut? Then on the upper ball joint to get the top 50 ft pound setting on the split ring there are threads showing (3 rows) on the bottom of the yoke. Will the affect anything? should the split ring be fully covered by the yoke? For upper you putting weight w/ jack to force the balljoint into sleeve before torquing it down? Sleeve goes in, force together by jack, then torque down. Guessing wasn't fully "up"/seated when torqued down? Far as lower nut, yes normal on it and acts as locknut. Yea I have a jack under the knuckle to force the ball joint in the sleeve. I have the truck on jack stands on the frame and not the axle so maybe there is not enough weight on the axle when jack it up. I will back off the split ring move stands to axles and try again. Thanks for the help! Backed out split ring put the jackstands under the axles to transfer more weight to them and then jack under knuckle. Still some threads showing but the knuckles turn super smooth now and seem to be good to go. So I have the drivers side completely done (everything went smoothly), started on the passenger side and ran into an issue. 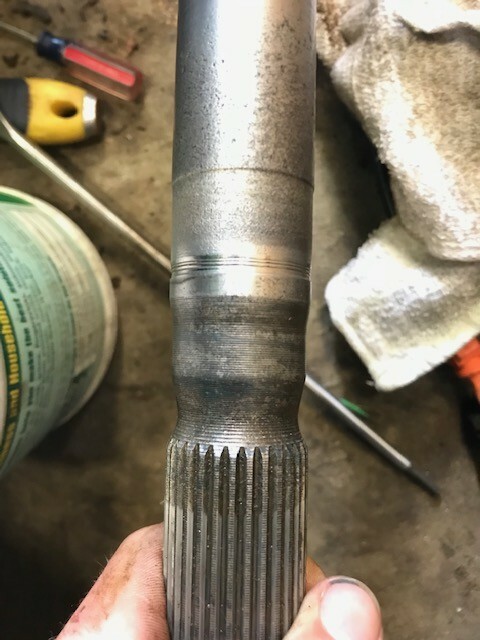 One thing I have discovered is someone upgraded this axle at one point because my spindles and inner bearings are the larger size (Im pretty sure 77 is suppose to be smaller and it changed in 78). The inner bearing race on the passenger hub was spinning in the housing, I thought maybe the race got damaged from all the heat from my event so I decided to try and press in the new race and see if it fit better. The new race is spinning in the housing as well. I am assuming this means I need a new hub? I have heard of some people using a punch to indent and push out metal in the housing to make up the tolerance, is this a good idea? Any suggestions? Used hubs are cheap to find, replace it, don't use the punch method, that's only for an emergency to get you back into town or selling it off to some poor soul. Installed the bigger 85 K20 chevy Calipers (bigger piston) on the drivers side tonight. I have the EBC RK series rotors and Green stuff pads. When I got everything installed I could not spin the rotor anymore. Without the caliper bolts in, but the caliper over the rotor with the pads in I can spin it (although the outer pad is rubbing on the rotor), as soon as I start to tighten the caliper bolts the rotor can no longer spin as the outer pad is fully against the rotor (the inner pad has about 1/8 inch of space between it and the rotor). I also started spinning the rotors without calipers and it appears the rotor might be slightly warped, I wouldn't expect this from EBC. Thoughts? Maybe my hub is not fully seated (although I locked the lock rings as per the TSM and everything looks like it went back together right) so its sticking out a little too far? Could the caliper bolt bushings be too long so its not letting the caliper move all the way over? did you grease the pins for the calipers? did you press the brake pedal to center the pads, did you press the rotors on straight and are they fully seated?, sounds like something is off? I greased the Caliper bolts/pins and bushings. I did not push the brake pedal to center because I don't have the passenger side caliper connected yet. But the outboard shoe is pushed all the way to the edge of the caliper and its resting on the rotor, so the only movement would be coming from the piston side where the 1/8th inch gap is. I used a couple washers and an impact gun to install the new suds onto the hub through the rotor and it looks like it is sitting flush on the hub so i am assuming the rotor is on there strait. All the studs are the same length from the face of the hub to end of stud. I guess I will install the other side tonight and see if I have the same problem. Did you stake the outer pad? The two small little tangs get staked to caliper while holding the large curved metal back of pad where it fits to caliper. Most people do not...it greatly reduces squeal issues. Sometimes pads are misaligned as well when they're glued/riveted to backing plates. Seen it many many times. A coarse file can be used to shave them if needed. Be sure the friction material covers the correct area of rotor though. If they're too far off return them for another set. I think I figured it out! There was a small knob on the casting of caliper at the bottom of the piston housing. That was hitting the caliper mounting bracket where I couldn't see, so it was not allowing the caliper to seat all the way. There is now a very slight rub of the pads but the rotor turns freely. There still might be something slightly warped as on spot on the rotor rubs a little more then the rest. This is on the driver side with the old hub so maybe the hub is slightly warped, I just can imagine brand new EBC rotor would be warped. So I might be getting a new hub for that side and seeing if that was the problem. I will see how the passenger side with the new hub and rotor spin with the caliper and pads in before making the call. Babywag can you describe the process of staking the outer pad? So the old hub must have been slightly warped, because I replaced it with a new hub and its spins perfectly now. There is very slight drag on both sides between the pads and the rotors. This is normal correct? Bleeding tonight and hopefully going for a test drive.